Going out Saturday night with a hometown friend and a bunch of her girlies...some of whom I know from back in the day (aka high school). 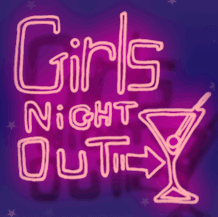 It's been a while since I had a true girls night so I'm pumped! Last I heard, we are renting a luxury van to get us into the city so no one has to drive. Feels a little like prom...minus the forties and dutchies. I've classed it up some over the years. With 10 girls in the group I'm anticipating some mild debauchery, especially on the way home...that is if I'm not passed out on one of the seats. I'm more of a lightweight than I used to be so I'll do my best to hold up. Must be ready for Sunday night softball!!! Should be a fun night...and after a week of locking myself away I friggin deserve it!